I love pasta! In my opinion, pasta is comfort food at its finest. Growing up, my family could always count on pasta at least one night out of the week. If you asked my brother what he wanted for dinner, it was normally spaghetti. On the other hand, Jeffrey remembers Mexican food as their “go to” dinner. It will be interesting to see what William and Tyler think of as comfort food when they get married because we honestly have quite a bit of both at our house. Jeffrey and I have come to an understanding about comfort food. Honestly, sometimes he is the one requesting the pasta and I am the one with a hankering for some Mexican food. I love scanning other food blogs or recipe indexes and have found several recipes for Cajun or Louisiana pasta and combined them to come up with one that worked for us. 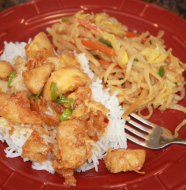 I think this recipe is a good mixture and one my kids also really like. Who knows, perhaps this will some day become one of my boys’ comfort foods. Try it and let me know if it could be one of yours. I like to grill chicken earlier in the week when we are using the grill and then I have the chicken already prepared so the rest comes together rather quickly. It helps with my meal planning and saves time in the long run. Rub chicken with olive oil and season generously with cajun seasoning. 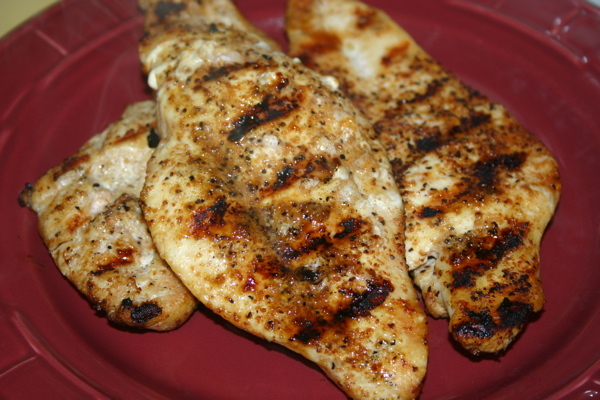 I prefer to grill my chicken but you could also cut it into chunks and saute on the stove until it is cooked through. If I don’t have some pre-grilled chicken on hand I grill my chicken and then cover with aluminum foil to keep it warm while I make the pasta and sauce. When the pasta and sauce are ready, I cut the chicken into bite-size pieces and toss in to the pasta just before serving. Bring a pot of salted water to boil. Cook the pasta according to the package directions. Drain and set aside. Meanwhile, add the butter and olive oil to a skillet and heat over medium heat until the butter has melted. 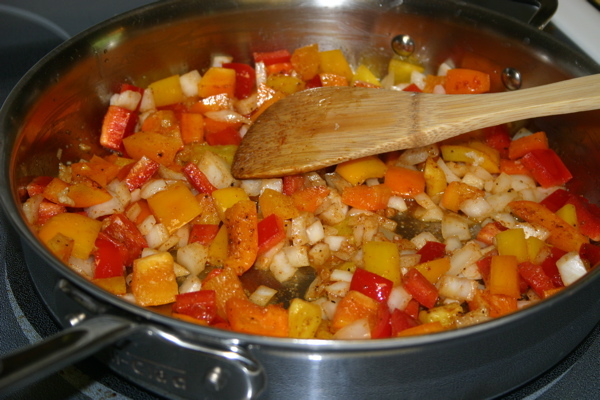 Add the bell peppers and onion to the pan. Add in the salt, pepper, garlic, cajun seasoning and cayenne pepper. Stir occasionally so that nothing sticks and your veggies cook evenly. Cook until the veggies are tender, about 6-8 minutes. Add the half and half (and cream if using) to the pan and bring to a simmer. In a small bowl, whisk together the cornstarch and water to make a slurry and add it to the skillet once the cream mixture has started to bubble. Allow the mixture to cook until it has thickened slightly, about 5 minutes. When the sauce has thickened, add the cooked pasta and chicken to the pan. Stir well to combine making sure the pasta is well coated in the yummy sauce. Top with green onions or chopped cilantro (if using). Serve immediately. This is delicious with some nice crusty bread. 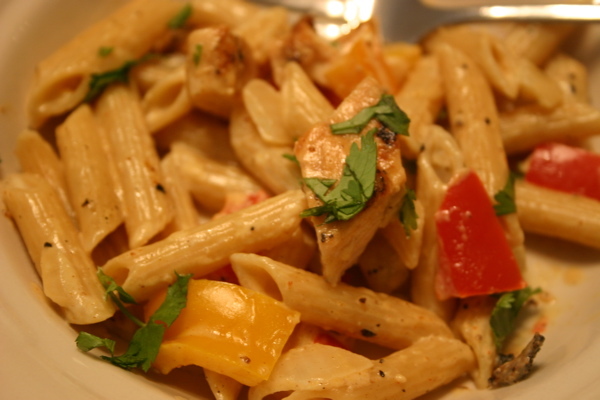 10 Comments on "Cajun Chicken Pasta"
OOOHHHH! I’m trying this! I am literally adding the ingredients to my grocery list! Thanks, Dinah! This dish looks absolutely delicious. I tried a recipe very similar, for a cajun pasta, and it turned out not to have any flavor. I can tell this would be way better. The blog is beautiful. Seriously, one of the best looking food blogs I have ever seen. You guys have done a great job with it!!! We had this tonight and it was wonderful! At five o’clock we had no idea what was for dinner and at six we were sitting down to enjoy whole wheat bowtie Cajun Chicken Pasta. Mike didn’t even have to add any more red pepper. I had a very long day and wanted some “comfort food” to start my weekend off right. This dish was PERFECT along with a fresh loaf of butter garlic bread from Costco. I was actually surprised the sauce wasn’t super hot with all the Cajun seasoning in it and on the chicken. But the half and half cut the heat so it had a nice mild kick but wasn’t overwhelming–a good amount of spice for my 6 year old (who doesn’t like a lot of spice). Dinah, I have one question about the recipe. You didn’t say where to add the garlic in your recipe. I used a fresh minced clove and sauteed it with the vegetables and was happy with the taste. Is that how you do it? 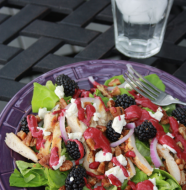 Thanks for the recipe–this will be great on a cold winters night! I am so glad you enjoyed it. Yes the garlic goes in with the veggies and other seasoning. Thank you for letting me know I missed it in the directions. I have updated the recipe. This is so much better than any other chicken pasta dish. We have made this 5 or 6 times sine you posted this. Thank you Dinah!!! Making this for the 2nd time and again cannot grill out, raining like crazy. 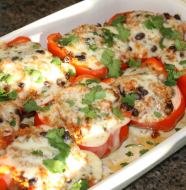 Love this recipe even though I do not like green peppers (I use green beans). Alec loves the chicken and Jake loves the pasta. Thanks for coming up with such family pleasing recipes!